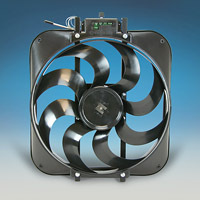 Made in USA 3000 CFM Fan/Shroud assembly. Shroud measures 18" x 16". Total depth is 4 1/4". "S" Blade design provides quiet operation. Manufactured by Flex-A-Lite but packaged and shipped in plain brown box to save you money! !